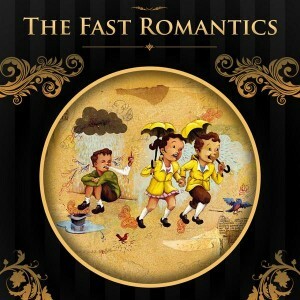 The Fast Romantics are an alternative (indie) rock band from Calgary and are most recently playing gigs to promote their self-titled debut album. Their sound kind of reminds me of a mix between Arcade Fire (to reference a popular band) and something kind of like piano-pop with some jazzy bits – with maybe a little mix of The New Pornographers, Hot Hot Heat, and The Strokes (in some of the synthesized stuff – more notably at the end “Stop Me”). Obviously with all of my references, they are a little hard to categorize, which is nice, because even though the genre isn’t my favourite, their music kept my quite satiated with an interest for they were throwing out on their first release. It was all quite varied too, there’s a lot of different sounds going on throughout the album – but not exactly all over the place, it all worked together nicely. 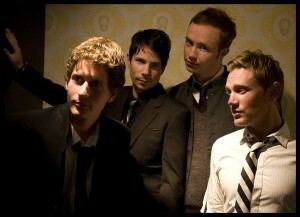 Very up-beat, very danceable (like lots of brit-pop and indie-rock) and overall a nice mix. I wasn’t shooting my mouth off about the “jazzy” bits either, “Mr. Magoo” features a trumpet, a clarinet, a trombone and a baritone sax (and a bass/guitar/piano/drums if those count too). If you want to get technical, several tracks also feature a viola, violin and cello as well. Keep in mind though, all of the external instruments are being played by external participants, or “special guests” which I list at the bottom of the post. The album artwork is very nice with masterful and playful illustrations by Dave Barnes and design by Matthew Angus (the vocalist/guitarist/keyboardist of the band). The illustrations take place throughout the cover, the inside flap, the CD, under the CD and even on the back – it’s all great, beautiful, and typeset mostly in Trajan Pro (to ensure the EPICNESS). So why am I featuring and reviewing a Calgary band when I have tons of local bands to write about? Mostly because one of the representatives from the band asked us to do a write-up and they also sent over a free copy of their album (thanks to Matthew Kliewer, by the way). Also, the main reason: they will be also stopping to play in Medicine Hat soon enough – details to be posted. Funnily enough, that track is oddly familiar to me, the intro sounds quite similar to a Mt. Royal song called “UNTITLED SONG” which we posted at the bottom of our “Featured Band” post about them, here. I think it’s just the clapping and ensemble at the beginning. This entry was posted on Thursday, May 14th, 2009 at 9:21 PM and is filed under Indie Music, Music Events, Rock Music. You can follow any responses to this entry through the RSS 2.0 feed. You can leave a response, or trackback from your own site.